Marinate the chicken pieces with the ingredients under marinade for at least 4-5 hrs. To cook rice I usually follow the draining method. Soak the basmati rice for around 30 mts. Boil water in a deep vessel. To the boiling water add ghee – 2 tsp, whole spices (peppercorns- 10, cloves – 6, cardamoms – 2, bay leaves-2, cinnamon stick – 2, fennel seeds – 1/4 tsp, star anise – 2 and mace – 1 – 2). I usually add lots of whole spices. Add enough salt. The water should be slightly salty. Now add the soaked rice and cook it to the perfect consistency. Drain the water and allow the rice to cool. 1)Coarsely grind the ginger, garlic, pearl onion, green chilies and the whole spices in a mixer. 2)Heat around 2 – 2.5 tbsp oil in a deep pan. Add the sliced onions and little salt. When the onion becomes light brown, add turmeric powder and coriander powder. Stir well for a minute and add the coarsely ground mixture mentioned above, few curry leaves and stir well for a few minutes or until the oil starts appearing. If it starts sticking to the bottom, bring down the heat and add little oil. 3) Add the chopped tomato and cook until it gets completely mashed up and oil starts appearing, about 5 – 7 mts. 4) Now add the marinated chicken, mix everything well and cover it with a lid. Do not add any water as water will ooze out from the chicken. Cook for about 10 minutes at medium flame. Bring down the flame to medium-low and cook covered until the chicken is done, stirring once or twice in between. It will take at least 45 mts for the chicken to be properly cooked. When the chicken is done, check for salt and masala. You can add 1 – 2 pinches of fennel powder or garam masala if you wish. Mix well. Switch off the flame. I usually fry the cashews, raisins and thinly sliced onions first and then use the same oil ( around 2 tbsp) for cooking chicken. 1. Fried onion – 1 small, thinly sliced. Fry it in hot oil stirring occasionally, until browned, takes about 20 minutes. Drain on to a paper towel. 2. Cilantro – 1 bunch chopped and fried till crispy (It will take only around 5-7 mts and it will be crispy and deep green in color). You can use fresh chopped cilantro if you wish. 8. Tomato – 1, Seeded, sliced lengthwise and then fried until cooked and lightly browned. It is optional. For layering you need a cookware which can be put on stove or which is oven-safe. I usually use a stainless steel stock pot to layer the rice and chicken since it can be used for both purposes. The biriyani can also be served in it. Smear the base of the cookware with ghee. Then add the fried onions, fried cilantro, cashews, raisins, mint leaves, grated carrot, pineapple, julienned ginger, fried tomato and chicken. You can pour a little gravy over the chicken pieces. Now add the rice and repeat the process. You can sprinkle some fennel powder or biriyani masala and ghee on each layer. 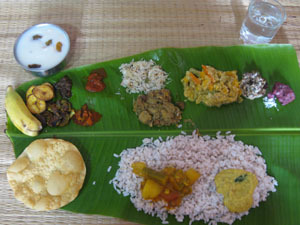 The top-most layer should be that of rice topped with the items under garnish. You can pour any left-over chicken gravy over it. Now seal the cookware with an aluminium foil (so that moisture won’t escape), cover with its lid and bake it at 350 F for around 15-20 mts (depending on the cookware you use). If you are planning to keep it for long, cook the rice only till it is 95% done or so. If you are using stovetop keep it at low flame for around 10-15 mts or you can double-boil it. Serve hot with boiled eggs, raita, papad, biriyani chammanthi and lemon pickle. You will never go wrong with this recipe 🙂 This recipe serves around 6-8 people. Dry roast all the ingredients lightly in a pan at medium heat for about 2-3 mts. When they cool down, grind to a fine powder in a coffee grinder. Store in an airtight container. It will be flavorful even if you do not dry roast them. Dry roast all these spices lightly, cool down and grind to a fine powder. (Dry roasting is completely optional). You can sprinkle some saffron in coconut milk while layering. It gives an extra taste and color. Cooking the chicken in ghee instead of oil will give an extra taste though it isn’t recommended health-wise. If you deep/shallow fry the chicken after it is cooked, the chicken will remain firm and more tasty. Adding cashew paste ( of around 10 whole cashews soaked in water for 10 mts or so) and/or coconut milk (around 3 – 4 tbsp) also gives an extra taste to the chicken gravy. You can use store-bought fried onion for garnishing. Use pearl onion (Around 25 – 30) instead of big onion to make the chicken gravy more tasty. You can crush it along with the green chilies, garlic, ginger and whole spices. Well written, and nice illustration. Thank you!! Wonderful work Yummy Team!!! Love these step to step photos! I tried this and its sooooo Yummy. hi please let me know ASAP how many people dose this measurement serves? Sorry for the late reply. This recipe serves around 6 – 8 people..
really tasty biriyani,i made this yday,but i felt rice is less for 6-8 ppl,did u use 200ml cup for measurement? Sorry for the late reply..I am in India on vacation now. I am not sure whether I use a 200 or 237 ml cup for measurement, will confirm it once I get back.. I have used a 237 ml cup for measurement.. I made this yesterday evening following the steps you specified… It was SO GOOD… My biriyani was always a flop.. I am happy that I got the exact method.. Thank you for the wonderful recipe. Thanks a lot for your feedback. Glad to know that you liked this recipe 🙂 Please keep visiting.. Thanks a lot for your wonderful words about the website. You made our day!! 🙂 Do let us know your comments/suggestions if you try out any recipes. Please keep visiting..Thanks again!! We were trying for a good kerala Biryani. This one was awesome, this tastes like a Hyderabadi Biryani, we prepared 2 times. It came well, Thanks for the nice post. At last I made a decent biriyani with this recipe. Thanks a ton!!!!!! Thanks for your feedback..Happy to know that you both enjoyed this dish. I use Kirkland basmati rice from costco..
cooking the chicken part the previous night itself & just doing the rice part alone in the morning? Waiting to hear from you… Thanks in advance. I recommend cooking the chicken part the day before and just doing the rice part alone in the morning. Make sure you leave enough gravy otherwise it will get dry after refrigeration. Hope it comes out well for you. Have a great time! Hi Maya.. I’m a doctor settled in Dubai.. I shifted there after marriage.. I never cooked ever at my home but when I came here v had big joint family I made ur duck curry, ur mutton and chicken biriyani and al came big hit.. I have taken time to thank u to start such a blog for the younger generation.. N al my credit goes to u so thank u..
You’re welcome! Great to know that you all enjoyed my recipes. Thanks so much letting me know..
Great to know that you like this recipe. Thanks for your comment! Wow, this recipe is extremely delicious. I also like the way you explain the procedures which is clearly stated in this post. also the pictures provided are great ,it show the texture of the dish for almost every steps that makes it more informative to your readers. So thanks for sharing and I’m wishing for more power to your site and continue to share your knowledge to us. God Bless. Can you please tell me the brand name of the pan you had used for deep frying.I have been looking for one but i don’t know which one to buy. Prepared the biryani, it was delicious. Thank you so much for this recipe. Really happy to hear that the little one liked it 🙂 Thanks a lot for taking time to write your feedback here..
Hi I made this yesterday and it canecout very well, recipie to keep! Thank you! Would it be due to addition of fresh pineapple? Do let me know your thoughts on this. Its not the pineapple but did you keep the hot biriyani covered for a long time, after it got done? If yes, then that could be the reason. The moisture that condensed on the lid of the pot might have dripped back inside and that might have changed its taste.